Things I had owned, used — things that had been a part of me — now have a second lease on life. Those stats are amazing. And they take into account that the size of the average American home has grown from 1,660 square feet in the 1970’s to 2,687 square feet now. 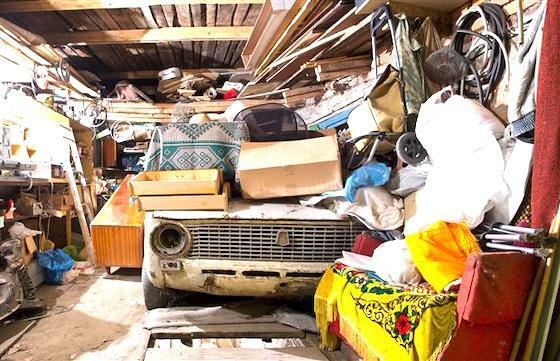 Does this resemble your garage? If so, you’re not alone. Source. I take a gentle, easy approach to streamlining my possessions. I might put a jacket that’s “on the fence” in the front of my closet for a week before I donate it. Maybe I’ll fall in love again. I’m not a fan of explosive clean-outs; I need some time to ponder. And all things coming into the home are similarly considered, except for cat food and chocolate. There are still moments of uncertainty: I am guilty of exaggerating or at least over-emphasizing the future value and usefulness of an item. If it’s so valuable, why is it sitting in my closet, hmmmm? There’s so much “stuff” in the world, we could get buried, even in my small condo. We have two televisions for just two people, never mind the computing devices. And there is no “scarcity” here! Bonus of letting go: fewer things around me means less cleaning (I can get compulsive about that). This is just about a third of my closet, awaiting inspection. And King the Cat, unperturbed. And of course, there’s the morbid reality that as the End of the Game gets near, someone is going to have to go through all my sh!t when I’m gone. Why not spare them the chore? Who wants to sort through my 25 pairs of tights? As always, this is not advice directed at my readers. You’ll do things the way that makes the most sense for you. Some of you find joy in collecting beautiful things, that’s lovely too. Since I am naturally curious, I’d love to know: what kind, if any, of de-clutterer are you? Please be aware that links to vendors may be affiliate links. I may benefit from your purchases through the links on the blog. 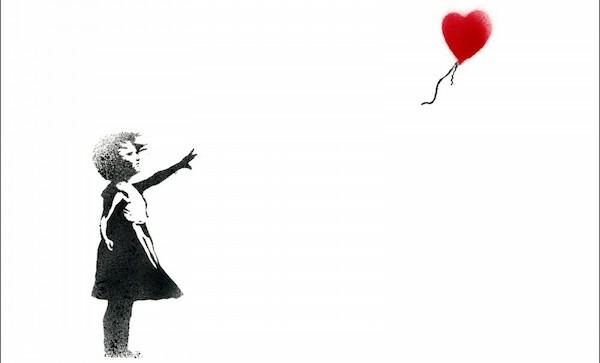 Header image of Banksy painting via this site. I usually have a “donate” bag on the go all the time so that if I try something on and think “Meh”, then it goes right in the bag. I have a small apartment that has no storage space so it seems like I have even more stuff than I actually do because there’s no place to hide it! Yes, this timely message resonates! I have a lot too, but like Suzanne, I have a rule about stuff in, stuff out ratio. I am like you, Patti – I like to ponder and get rid of things gradually. I get emotionally attached to stuff, like many people I think – things remind us of our personal and family history and have more value than money… But yes, it’s a lot of work, and I do have a goal to keep my things reasonably organized some day. 🙂 I very rarely sell my used stuff (or even unused new things) – I just give it away, to people or organizations such as Goodwill, and I agree with you, it does feel good. My life seems to revolve around not buying too much, and then getting the guilts from too much stuff! I think I have a ‘space’ problem rather than a ‘stuff’ problem, but it is probably a bit of both! Great to read your thoughts on how you deal with the situation. I am a mix of ‘gungho’ clearing out and the more gentle ‘pondering’ method of clearing out… If my husband had his way it would be all out! We are newly empty nesters and I started the downsizing process a couple of years ago. Decluttering is definitely something you need to keep on top of. My closet and drawers are “due”. lovely post and a really interesting reading! I think that the more space you have, the more things you put in it. We moved from a tiny apartment of 645 square feet to bigger and bigger flats and I’ve always managed to fulfill them with my clothes and crafty stuff (hobbies take up a lot of space). I’m trying my best to keep things tidy and did some periodical declutter, but I’m not becoming a minimalist at all! As always, amazing timing for me, thank you Patti! I stash things away until I can bear it no longer and then, when I get mad with myself, I attack! Latest attack came on when good friends donated there unwanted items but most of it belonged in the bin! If it is old, stained and the wrong size then bin it, don’t donate it. 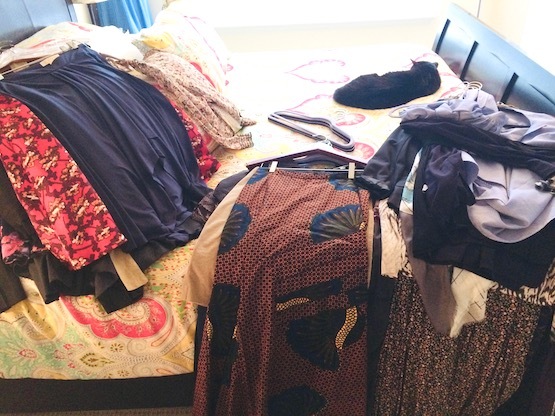 But I now have two big bags (and growing) of what I consider good stuff to donate to my favourite Charity Shops. Oh and it feels so good. Love the empty hangers sitting there … just waiting for the perfect purchase. Since you ask, I’m an easy-peasy declutterer without a manual. works for me. In the nearly 3 decades my husband and I have been married, we have lived in a variety of home styles–starting at a tiny studio and growing into a large 4 bedroom house for just two people! No matter how small or big, we have managed to cram each space to the gills with junk. And you’re right–it is a hassle to maintain and keep clean all that space and all that stuff. I would like to say we’ve gotten better at this now that we downsized to a smaller condo, but the truth is, we still have cabinets and drawers that overflow with things we forget about once they’re in those drawers and cabinets. The difference now, though, is that we tend to be a little more mindful about what we bring in than we used to. We don’t always get it right–my fabric and sewing pattern stashes are growing as we speak–but we do try. One other resource you might be interested in is the Buy Nothing project. The idea is that you sign up with your community and then you offer up things you’re not using anymore to your neighbors. They do the same. I’ve seen everything from toys and clothes to barely used shampoo bottles and unopened salsa. Personally, I’ve given away kitchen pans, lamps, and books that way. It’s a neat idea. Thanks for this lovely reminder, Patti. As Suzanne said, your timing is perfect–just before the crush of Black Friday. I think this is a perfect post for today, one day ahead of the notorious Black Friday where people consume even more than usual. We had our Thanksgiving over month ago in Canada but you never hear someone saying, “I’m thankful for my 20 pairs of jeans.” Thanksgiving is an opportunity to re-evaluate ourselves and our closets. Let’s work towards keeping the earth alive.